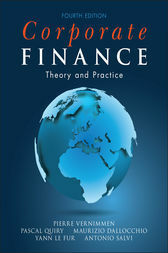 Pierre Vernimmen (deceased) was a founding member and first coordinator of the Finance Department at HEC, where he established himself as a leading academic in the field of corporate finance. ?In 1973 he joined Paribas, initially as a private equity banker, moving onto the advisory business line which he set up and managed from 1993 until his death in 1996. Pascal Quiry (Paris, France) is MD in the Corporate Finance department at BNP Paribas, and affiliate professor of finance at HEC. ?Pascal is board member of the French Finance Association and member of the American Finance Association. Yann Le Fur (Paris, France) is a senior associate in the Paris Corporate Finance department of Schroder Salomon Smith Barney, and a lecturer at HEC. Maurizio Dallocchio (Milan, Italy) is former Dean of the leading Italian business school Bocconi (Milan) and Lehman Brothers Chair of Corporate Finance. He is also a board member of several listed and unlisted companies and is one of the most distinguished Italian authorities on finance. Antonio Salvi (Milan, Italy) is an Assistant Professor of Finance at Bocconi and the University of Venice where he teaches Corporate Finance.